This itinerary skirts the municipal borders of Vigo across its mountainous side, giving remarkable views of the city and the ria. It is a route designed to show people from this large city the natural environment that spreads out just a few metres from their homes. A series of forest parks have been located in parishes in Vigo District which, equipped with everything necessary for leisure and rest, are decisive in this pathway’s massive success at weekends. There is also place for history, however: the Fragoselo petroglyphs, the dolmens in the area of El Mercantil and the remains of the old defensive wall of Monte O Galiñeiro. Rural architecture in Chandebrito and Fraga, the beautiful site of the As Maquías mill on the River Zamáns, autochthonous forests and this whole natural environment far removed from the hustle and bustle of the city, making this a highly attractive and much visited pathway. ACCESSES – By town bus to Saiáns, A Garrida, University, Rebullón, Airport and A Madroa. In Saiáns, leave from the Church of San Xurxo. In A Madroa set off from in front of the zoo. DISTANCE – 58.2 km in total. The main pathway covers 39.9 km and the variations GR 53.1 and 53.2 cover a distance of 8.1 and 10.2 km respectively. 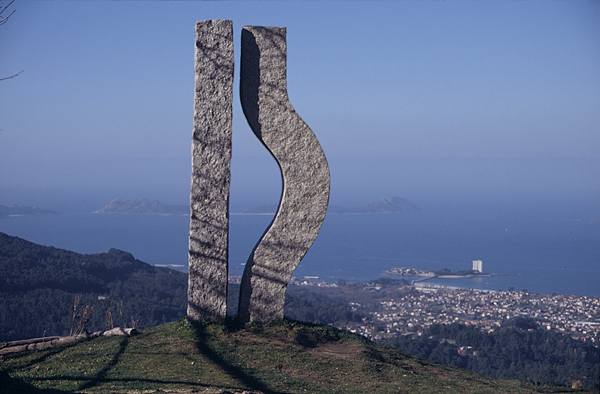 POINT OF DEPARTURE / ARRIVAL – Saiáns (Vigo) / A Madroa (Vigo). ROUTE – Saiáns, A Garrida, Puxeiros and A Madroa. DIFFICULTY – Medium. This is a very long route, so it is recommended to be tackled over several days. It has a large number of ups and downs although the going is quite gentle. CONNECTIONS – With PR-G 1, 5, 9 and with GR 58 and 94. MATERIAL – If the plan is to do the whole pathway in a weekend, you will need enough equipment. Water is easy to find all along the route. SERVICES – Provisions in the towns surrounding Vigo. ACCESS BY BICYCLE – Partially suitable. ACCESS ON HORSEBACK – Totally suitable. No 223-II Redondela, 223-III Vigo, 223-IV Mos, 261-I Baiona and 261-II O Porriño.